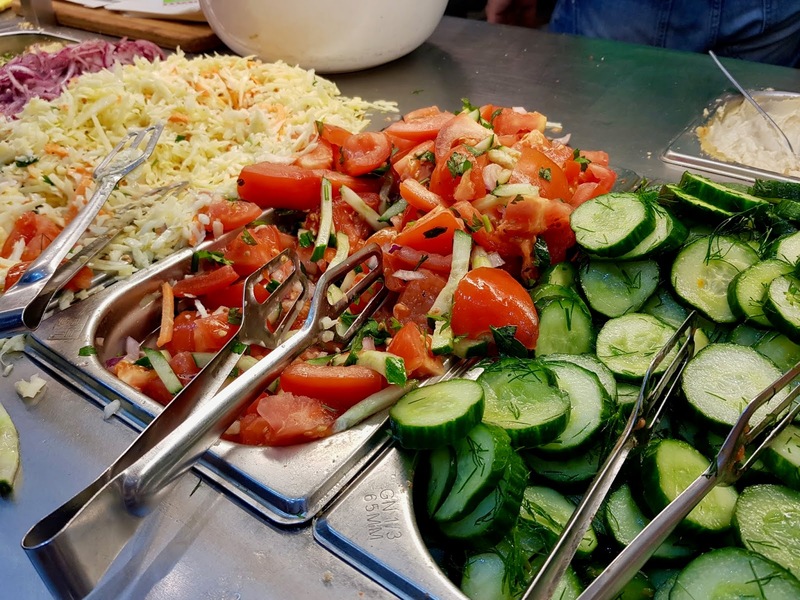 If you follow a diet such as vegetarianism or veganism, finding food in a new city can be a bit of a struggle, especially in mainland Europe. I have found when travelling to places such as Portugal and Italy in the past that even finding a sandwich can be difficult. Many food establishments, even in the airport, catered exclusively to meat-eaters. 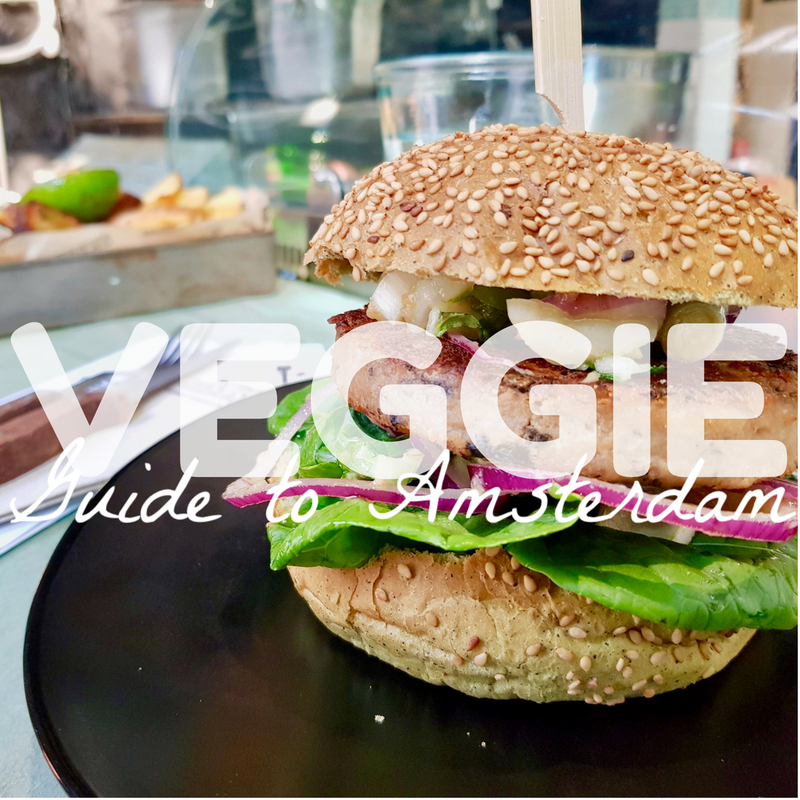 However, on my recent travels to Amsterdam, I was able to find some fantastic veggie and vegan eateries that met my needs exceptionally well. 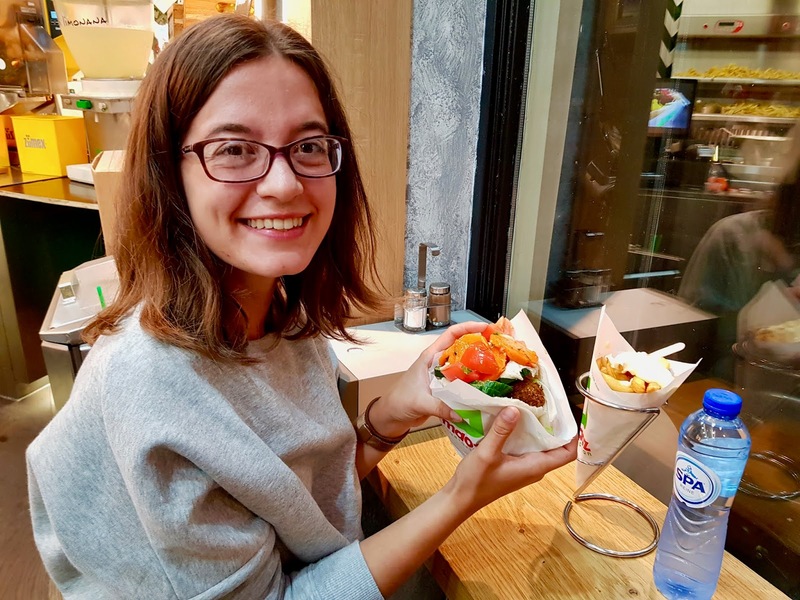 Today, I've decided to share all of these meals with you, so that you too can scope out the best veggie and vegan haunts that Holland's capital has to offer. 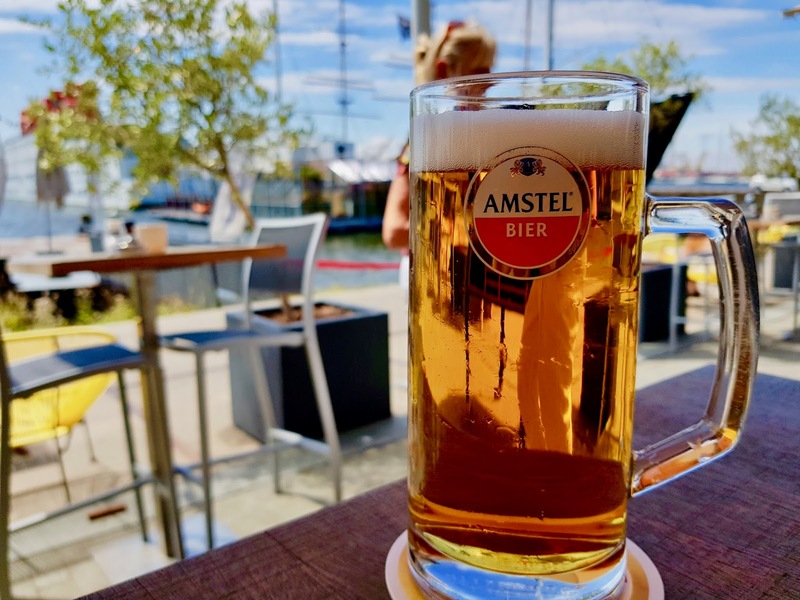 As you'll have learned from my Amsterdam highlights travel guide, one of our first sightseeing trips in the city was a boat tour of the beautiful canals. But once we'd finished exploring the scenic waterways, we had worked up quite an appetite. In search of food, we took to the water again, catching one of the free ferries to the neighbourhood of NSDM to visit the IJ Kantine, which is located right on the shoreline, about a 3 minute walk from the ferry dock. The restaurant itself is quirky and contemporary with very cool and artsy decor to match the overall vibe of the neighbourhood. It had a great chilled atmosphere and surprisingly it wasn't bustling with tourists. It was a clean and comfy venue to take a rest stop, but what about the food? ... My boyfriend was eager to order a refreshing beer and once we'd done so, we settled down with the lunch menu. There sadly wasn't a huge selection on offer for vegetarians (you could order a soup or a cheese sandwich so not super inspiring) but I was able to find enough on the snacks portion of the menu to keep me satisfied until dinner. My boyfriend who does eat meat opted for the fried eggs on toast with slices of roast beef, which he seemed to enjoy, and I opted for a bowl of spring rolls and some nachos with guacamole. The spring rolls were delish, they were crunchy and flavourful, I'd definitely recommend them. Sadly, I can't say I'd have the nachos again. The chips were extremely salty and there wasn't enough guacamole for the large portion. Adding some tomato salsa on top would've been a definite improvement. After a much needed nap at our hotel to recover from our coach journey, we headed back to Centraal Station to scope out some dinner. 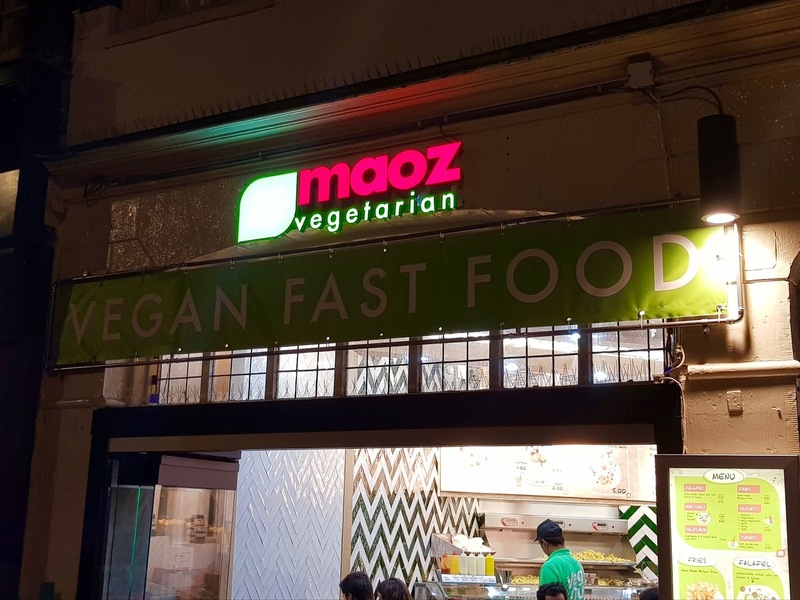 We wandered pretty aimlessly until coming across Maoz Vegetarian, which had a pretty large queue outside, and for good reason. This was very much a fast food venue, where you could go up to the buffet-style bar to select your meal and then take it away. There were a few benches where you could sit and eat alongside other punters but these were also very busy, so we were lucky to grab some seats! This place was a bit like McDonalds for vegans, so it wasn't the best atmosphere in the world with a lot of hustle and bustle but the food? OH BOY. 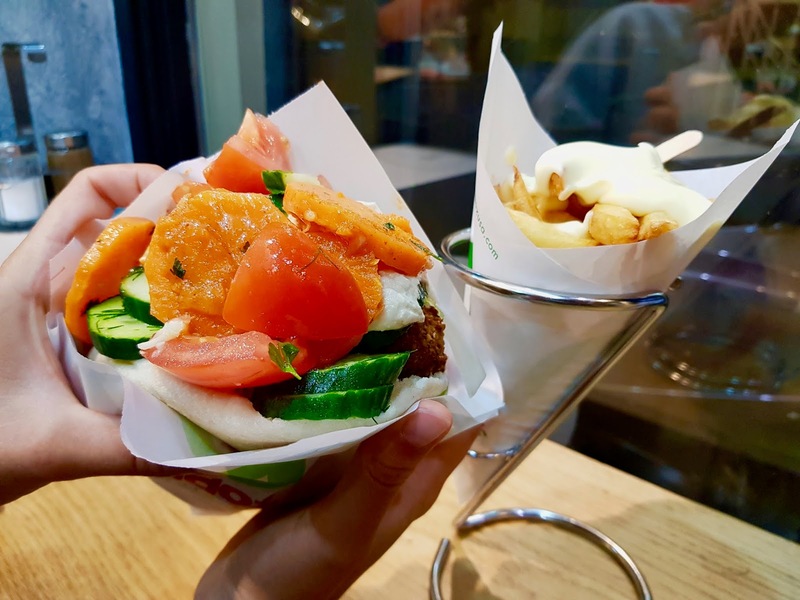 ...I selected the Maoz signature dish, their falafel sandwich and I was not disappointed in terms of size or taste! As you can see, the sandwich is ENORMOUS and they were assembled from fresh ingredients right in front of you. A lightly toasted pitta bread was stuffed (and I mean stuffed) with falafel balls still steaming the fryer. We then had the option to add as many salads and sauces as we liked. As you can see, I piled my wrap high! The grilled carrots and tomatoes were to die for, and the houmous was absolutely delicious too. Since my eyes were definitely bigger than my stomach that night, I also ordered a portion of chips, slathered in vegan mayonnaise. These too were delicious - I couldn't recommend eating at Maoz highly enough! 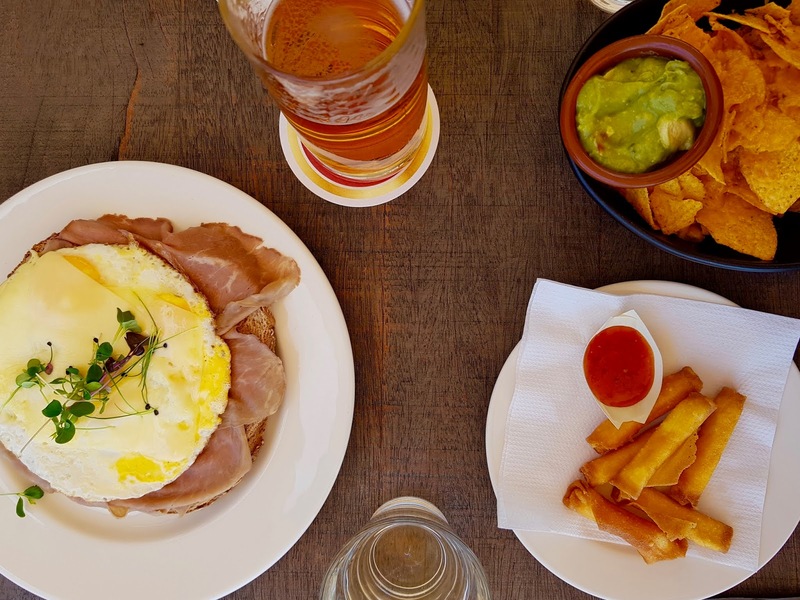 They have restaurants throughout the US, Holland, France, and even Brazil, so definitely look out for them if you travel to any of these locations. Museum-going definitely takes it out of you! By the time we'd finished our tour of the Rijksmuseum on our second day in Amsterdam, we were ready for some serious nosh. 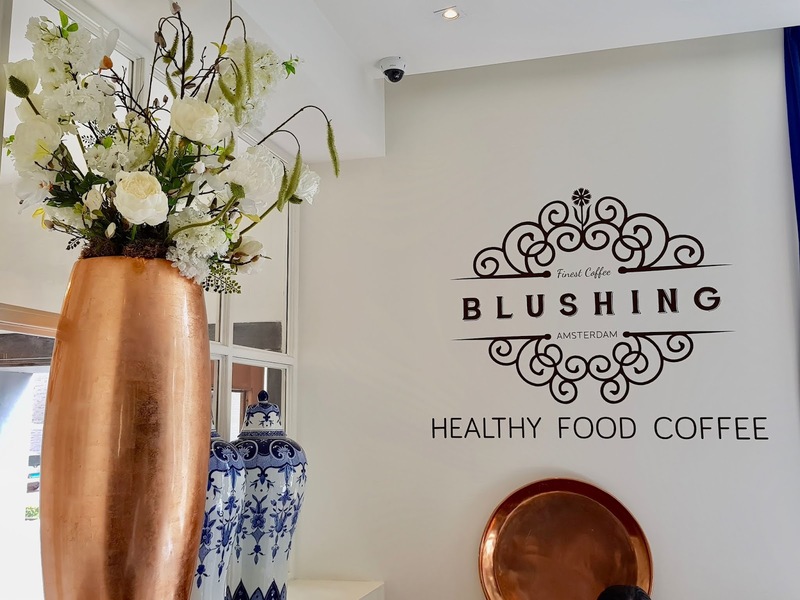 Thankfully, the Blushing Cafe was on hand to sustain us with a healthy and hearty lunch. I absolutely loved the decor of this place. 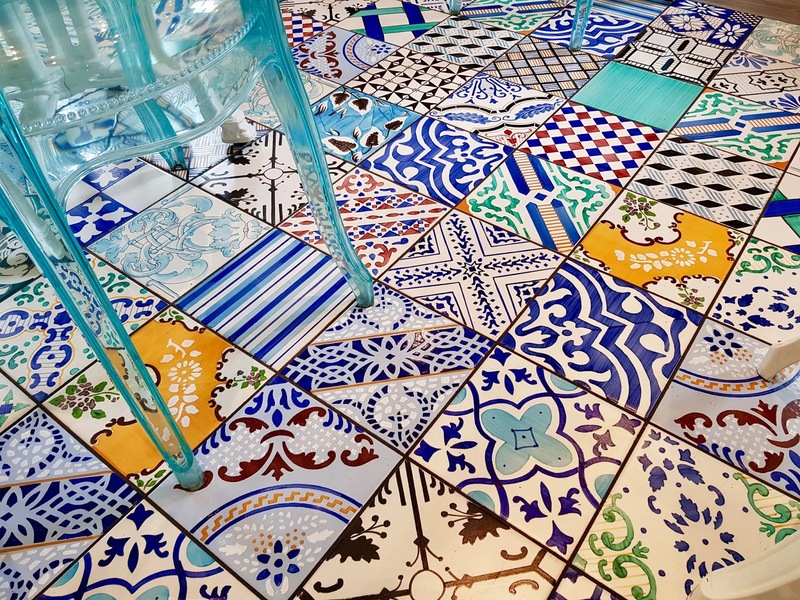 Anyone who follows me on Instagram will know that my current colour of choice is blue, so to walk in and be greeted with stunning blue tiles and blue chairs obviously set my blogger's pulse racing. Everything was very classy with big mirrors and flowers everywhere! Move over Peggy Porschen, there's a new Instagram hotspot in town. 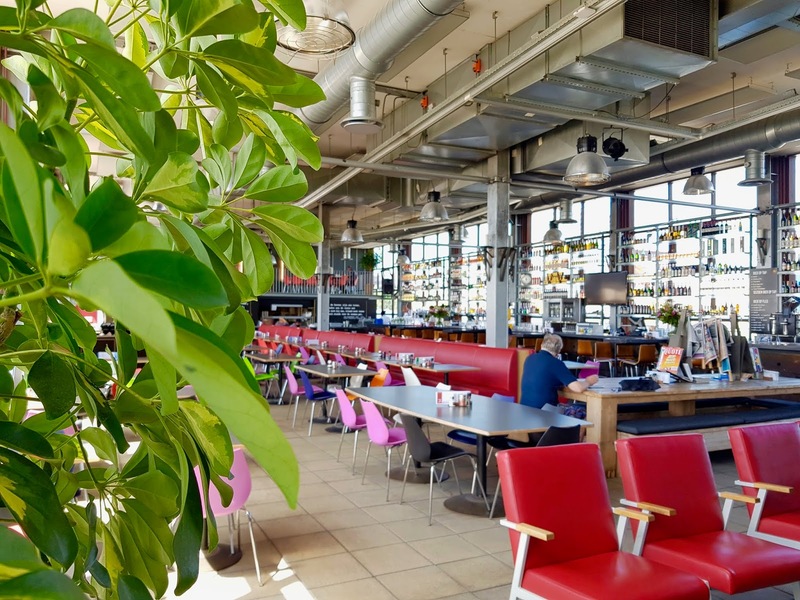 The staff were all very smiley and friendly, happy to advise on the dishes that could be cooked promptly, as we had a time slot for entry to the nearby Van Gogh Museum that we couldn't miss. ... I went for the You Butternut! 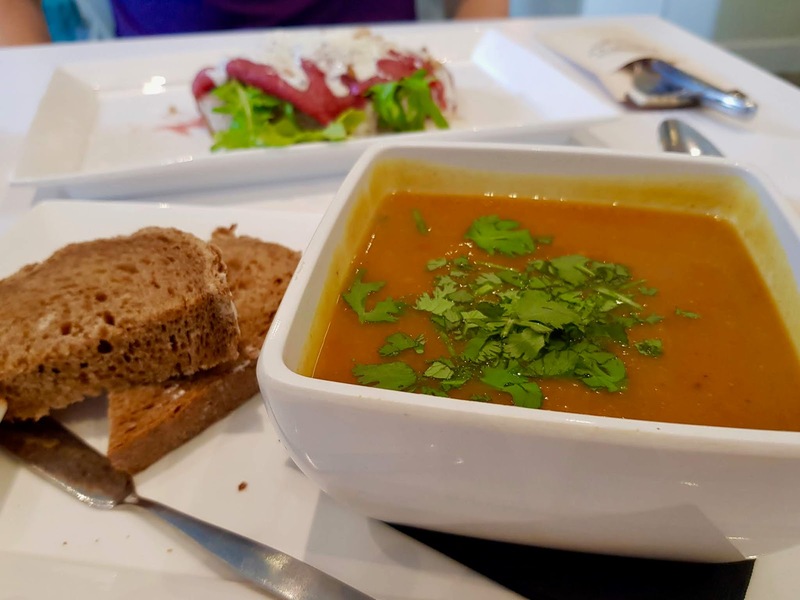 Soup from the lunch specials menu, a butternut squash soup cooked with coconut milk and curry powder, served with chunky bread and a generous seasoning of chopped coriander. The soup had a lovely thick and satisfying texture with the bread providing the perfect complement. Everything was served piping hot and the flavours were perfectly balanced, the curry powder wasn't too spicy or overpowering. Although I thoroughly enjoyed my meal, I was a bit disappointed to discover that this cafe has a policy of not serving free tap water unless coffee or alcohol is ordered. We had to pay for tap water even though my boyfriend and I had both ordered main meals, which was a big surprise for me. 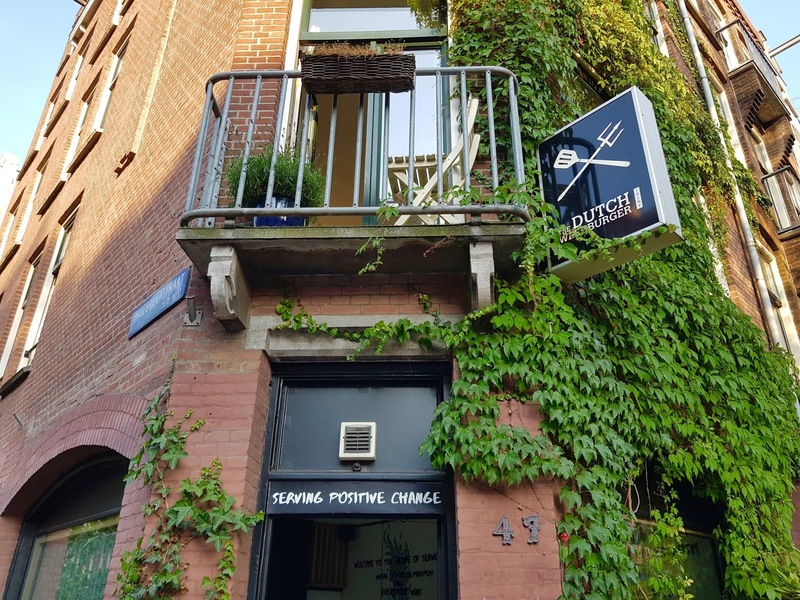 We didn't experience this in any other Amsterdam restaurants so I don't know how commonplace this is in Holland, but it is definitely something to look out for at Blushing. Did you even go to Amsterdam if you didn't sample the weed?! Well, the weed that I enjoyed trying out in the city probably isn't the first variety that springs to mind. I left the marijuana alone in favour of a delicious seaweed burger at the humorously named Dutch Weed Burger Joint. 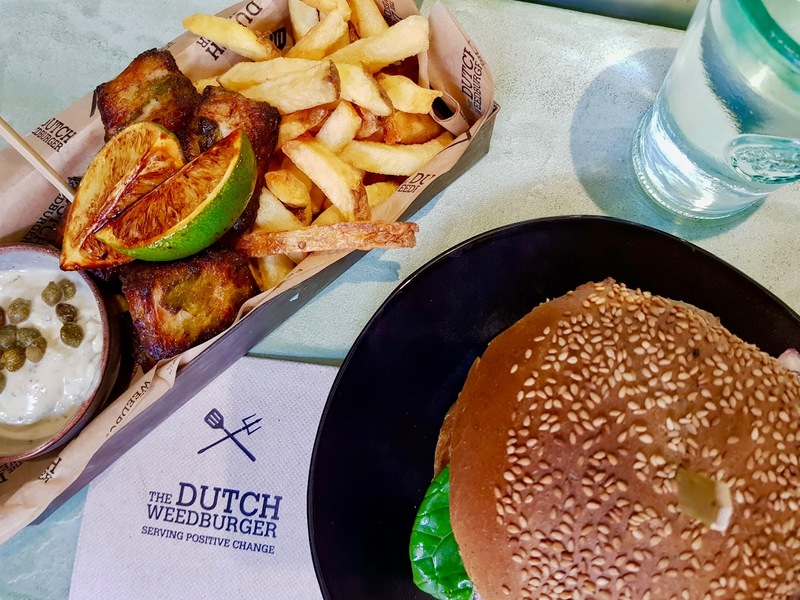 I dragged my vehemently anti-vegan boyfriend all the way to the neighbourhood of Oud-West to sample the burger at this place and I certainly wasn't disappointed. 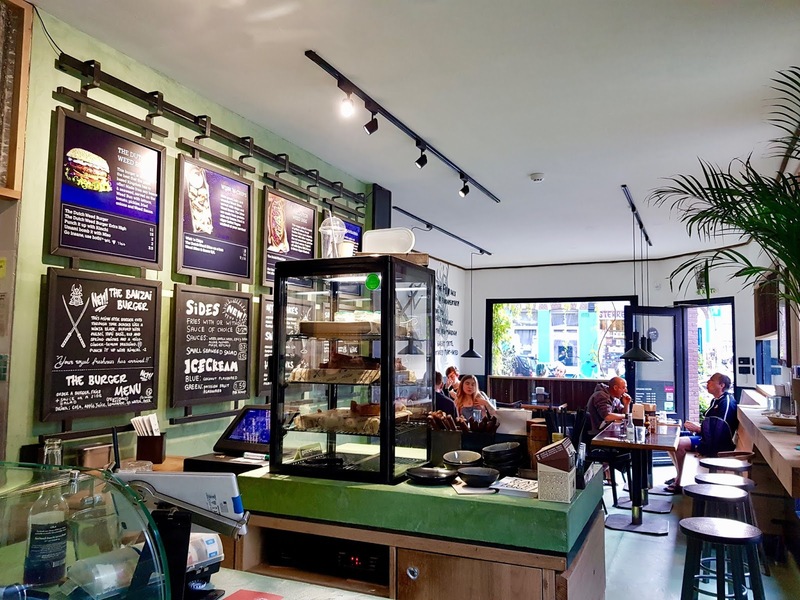 I loved the atmosphere of the Burger Joint, it was located down a little side street that was a real gem, with beautiful architecture and lots of leafy greenery outside. We arrived in the middle of the evening rush but the staff were still very welcoming and attentive, you couldn't fault their customer service. ... As for the food, this was my favourite dining experience in the whole of Amsterdam. I even managed to convince my boyfriend to try his very first all-vegan meal and to his (and my!) surprise, he really enjoyed it. He tried the Wish and Chips, a plant based version of a traditional English classic. Instead of fried fish, the "meat" of the meal comprised protein rich beans and micro-algae, and it was absolutely delicious! The texture really was meaty and the bites were very filling, I managed to snaffle a few from his plate and I wish I could've come back to have a full serving for myself. I ordered the classic Dutch Weed Burger, which came served in a seaweed bun, meaning it was bright green inside! The burger itself was also made from seaweed but the tastes weren't same-y, they were all distinct and worked together so well. The Dutch Weed Burger Joint bill this burger as the healthiest on the planet, but I'd have to say that it was the most delicious too! 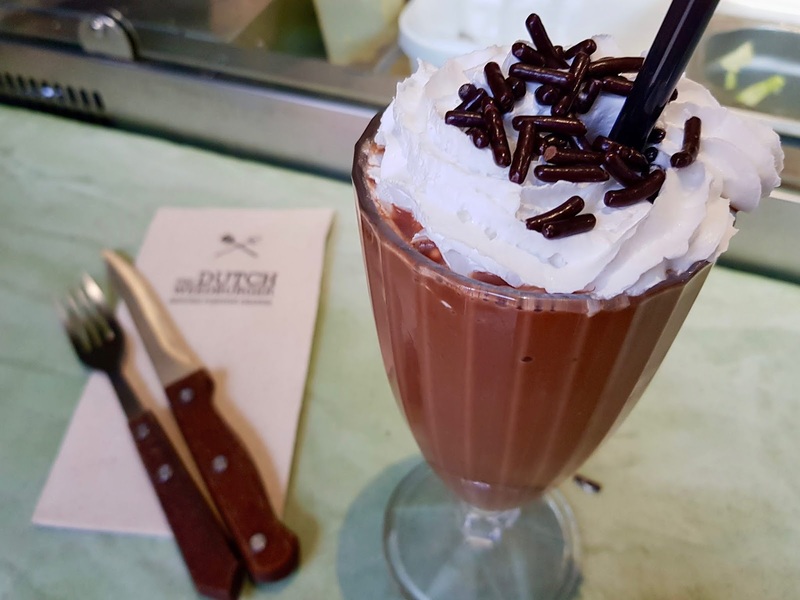 I washed down my meal with an amazing chocolate milkshake. This place is on the pricier side but I think it was worth every penny. What are your culinary preferences when travelling? Do you like sampling new cuisines or do you prefer to stick to what you know and love? Let me know down in the comments.